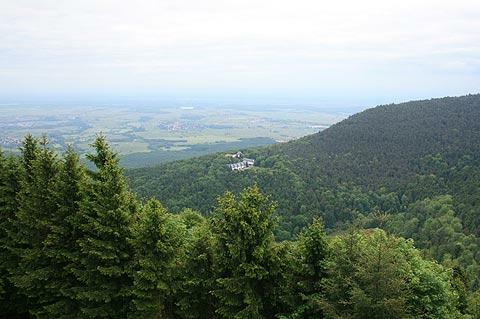 Mont-Sainte-Odile is the site of an important monastery, situated in a picturesque location on the top of a mountain in the Vosges and a few kilometres north-west of Chateau Andlau and south-west of Obernai (in Alsace). The monastery is now a hotel. Occupied since earliest times, it was Sainte-Odile who created a monastery from an existing castle at this strategically important point around the year 700. The monastery remained in use for 11 centuries, until the revolution in 1789. It was subsequently re-acquired and resumed its original monastic role from 1853. The site is very popular with both tourists and pilgrims, attracted not just by the complex of buildings but also by the far-reaching views and the pagan wall that surrounds the mountain top. Until the seventh century the location was the site of the Chateau de Hohenbourg which was owned by Duke Etichon, the father of Odile. (See below for the story of Odile's life and the events and miracles that led to the castle being turned into a monastery). Entering the main building you first reach a large paved courtyard, with ancient lime trees and a 12th century fountain. From here you can reach the church, the pilgrim's hall and the cloisters. The church is a 17th century baroque style reconstruction of a 12th century church and contains stained glass windows telling the story of the life of the saint. Next to the church a second courtyard contains pretty gardens and a statue of Saint-Odile, leading to a chapel where you can see the tomb and sarcophagus containing the remains of Odile. This leads on to the cloisters and then a large terrace with amazing views across the countryside, and another statue of Saint-Odile. Below the monastery a 'Stations of the Cross' pathway leads to an ancient water source, with the water being attributed healing powers for eye problems. 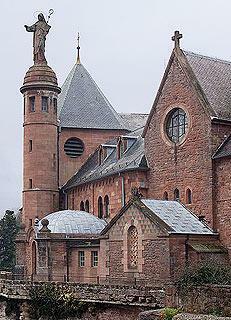 The site of the monastery at Mont-Saint-Odile is also now used as a hotel - restaurant. Mont-Sainte-Odile has a second surprise - an ancient wall that runs for 10 kilometres around the top of the hill. Up to three metres high and constructed at least 2500 years ago (and quite possibly long before that) the original purpose of the 'pagan wall' is unknown. A defensive purpose has been suggested for the wall, but with little evidence that this was the case, while other historians suggest the wall formed part of the activities of an ancient cult, and others that it was simply to keep cattle together in one place. Tracing the history of the wall is complicated because it was subsequently repaired by the gauls, and then a substantial amount of the rock from the wall was used to build the monastery. There is a path (allow four hours) that follows the course of the wall, which is now a listed Historic Monument. Saint Odile's story is quite an interesting one. She was born in the 7th century to Aldaric (Etichon), Duke of Alsace. He wanted a son but when his sick, blind daughter was born he ordered her to be killed. His wife gave her to a nurse who hid her in a convent. When she was 12 years old Odile was christened and immediately recovered her eyesight. She was then given the name Odile, which means 'girl of the light'. Odile then decided she wanted to come home and her brother Hugues came to fetch her. Out of revenge for the deceit their father then killed Hugues, but soon repented and tried to marry Odile to a young prince. She refused the marriage and hid in the mountains. Just as her father was about to seize her the rock miraculously opened and hid Saint-Odile. Aldaric was amazed at the miracle and Odile became a nun. Her father then gave Odile the Castle of Hohenbourg which she turned into a monastery. 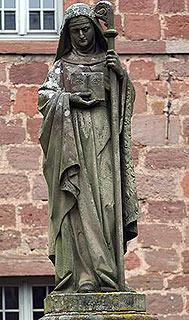 After her death in 720 her tomb became a popular pilgrimage site, and Sainte-Odile became patron saint of Alsace. On a sadder note, it was near here that an aeroplane crashed in 1992 - the crash of Mont-Sainte-Odile - killing 87 passengers. 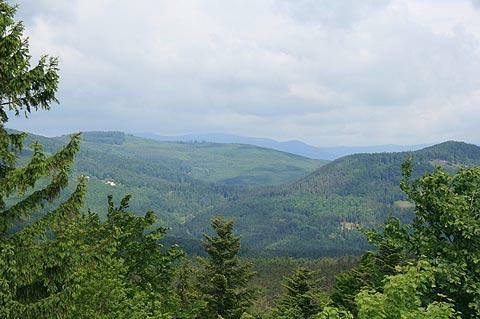 This part of Alsace, between Colmar and Strasbourg, contains numerous pretty villages and towns as well as the picturesque scenery of the Alsace vineyards - for some of the highlights near Mont-Sainte-Odile see the Alsace Wine Route guide.